You need a sprayer that’s ready when you are to take advantage of the perfect agronomic window to get into the field. You want it to provide consistent, accurate application across every piece of ground, and to work smoothly and reliably all season, every season. That’s what today’s Patriot sprayers are designed to do, in an application package that fits your operation perfectly. That’s technology, engineering and expertise combined to keep plants healthy and maximize yield potential. That’s Case IH Agronomic Design. Both growers and commercial applicators know that timeliness of application is critical. Most often, you’re facing long days and short application windows. That’s why you need a sprayer that can work as long and hard as you do. Patriot sprayers offer the most advanced factory-installed spray technology on the market. Our durable Case IH FPT engines are built to deliver proven power and fuel economy, while the spacious, full-featured cabs allow you to do your job in comfort. 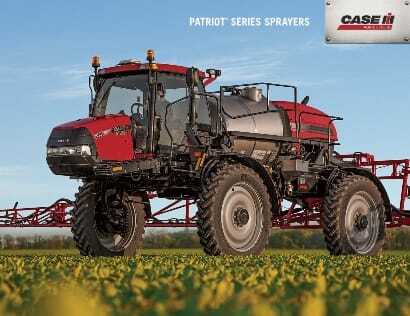 The cab-forward, rear-engine Patriot design does much more than create our distinctive Case IH sprayer look. It provides more equal weight distribution across the machine, getting you into wet fields earlier for more timely application with less rutting and soil compaction. At the same time, optional 360-degree HID lighting adds hours to your day, while optimum use of efficient horsepower means you can cover more acres faster. Crop protectants can only be as effective as the quality of the application. AFS AccuGuide™ autoguidance helps reduce skips and overlaps, while the AutoBoom automatic boom height control maintains optimum spray height for better coverage. AIM Command spray systems are designed to maintain both a constant rate and constant pressure under a range of speeds and conditions, as well as use a single tip for multiple applications. Patriot sprayers offer exceptional space to work in, allowing operators to stretch out their legs during those days when long hours of spraying are required. Vast amounts of cab glass and a well-thought-out cab design offer unrestricted visibility to the front and sides when traveling down the field or maneuvering around obstacles. Simply line up the gun sight on the front of the hood and you’re ready to drive all day. Inside, the seat-mounted control console moves with the seat for near-effortless operation of sprayer controls. The AFS Pro 700 color display can be mounted on the control console or on a separate mounting bar for line-of-sight visibility of rate control and guidance functions, allowing you to focus on the field ahead. Just how tough are these machines? Here’s a hint: The very first Patriot we ever built is still up and running. Maybe it’s the welded one-piece tubular frame design. It could be the simple but durable trailing-link suspension. Taking care of these sprayers is simple; routine maintenance items are located on one side of the machine and easily accessed. That saves time, so maintenance is less likely to get skipped when things get busy. And like the frames, our booms are designed for maximum strength, unequaled durability and unmatched reliability. The aircraft-style trailing-link suspension provides a smooth ride for operator and machine alike. Even over challenging fields, this suspension system absorbs both vertical and lateral shock loads in ways no other suspension package can. The optional active suspension is perfect to make light work of hilly terrain. The cab-forward, rear-engine design allows the machine to provide an extremely light footprint, yet maintain powerful performance. Field conditions and Mother Nature don’t always cooperate when it comes time to spray. The even weight distribution of the Patriot sprayers allows you to get into the field sooner and on to the next with less rutting and soil compaction. Constructed of welded, one-piece rectangular steel tubing, the frames of Patriot sprayers are engineered for durability and long service life. The rigid, low-deflection frame not only protects the cab, product tank and power plant from field loads, but it also provides a stable attachment point for the sprayer’s booms. The booms of Patriot sprayers are engineered for toughness and rigidity. Large, rectangular tube structure and a truss-style design with fewer but larger support members are the basis for their strength and durability. Independent right and left booms, plus full boom and boom tip breakaway features, are designed to respond to tough field stress loads. Case IH offers choices of boom widths and options to fit any application – each one built with the rugged and durable parallel-link design for years of solid service. Patriot sprayers’ advanced boom and boom suspension design provide superior strength without excessive weight and a wide range of spray heights for various crops and conditions, while also maintaining boom position at all speeds. That means that even in high-speed turns, the boom tips won’t “dig” in. AccuBoom automatic boom section control automatically turns off boom sections when the sprayer enters an area that has already been sprayed and then turns the sections back on when leaving the applied area. AutoBoom automatic boom height control detects changes in terrain and adjusts the booms accordingly. This not only decreases operator fatigue and wear and tear on the machine, but it also increases the accuracy and coverage of the applications. Configure your AutoBoom system with additional ultrasonic sensors or gauge wheels to maintain a level spray platform. This will provide the best possible application and maximize boom life. The AutoFold Plus boom fold/unfold feature is part of the Case IH 36.5 m (120 ft.) spray boom package. With the touch of a single switch the unfolding process begins. In about 30 seconds, the inner-, mid- and outer-boom sections are completely unfolded and the center section height is lowered to its most recent setting. This return-to-height feature eliminates guesswork about boom height when moving from field to field. Patriot booms offer greater durability and longer service life. The parallel-link design delivers the versatility retailers and growers need with a 1.65 m (5.41 ft) range of motion (1,60 m for Patriot 2230) for spraying pre-plant, post-tassel or anytime in between. Getting the most out of every tankful of product, every hour of the day, and every acre of ground is what Case IH Patriot sprayers are all about. The optional AIM Command advanced spray system can maximize your Patriot sprayer’s effectiveness by optimizing application rates and droplet sizes in every spraying condition, in every part of the field. AIM Command allows operators to increase their spraying speed, get better application quality and ensure consistent coverage. To manage flow rate, AIM Command automatically adjusts the pulse width via a solenoid at the nozzle body. This ensures a constant application rate at a specific, constant pressure even as sprayer speed and field conditions change. Realize greater control with the most accurate application system you can get. AIM Command delivers constant product application rates and spray pressures even as your speed changes. Constant spray pressure at the boom is maintained for the operator by the system’s independent pressure control. The AIM Command system’s computer uses the sprayer’s product pump to control pressure independent of application rate and ground speed. Three conveniently placed switches put true application control right at your fingertips, letting you choose the AIM Command system or conventional spraying and control pressure settings. The operator can drive according to field conditions without concern for pressure deviation, so average field speed can increase by one, three or even more miles per hour. With independent control of the speed, pressure and flow, AIM Command is able to increase the sprayer’s production potential and reduce the cost per acre of running your Patriot sprayer. That’s proven productivity. Changing weather and wind can make spray patterns difficult to control. AIM Command allows you to toggle between two preset spray pressures, providing “on-the-go” drift control. Constant boom pressure and droplet size can be maintained throughout an 8-to-1 speed range, so AIM Command applications result in better coverage in every acre of the field. This eliminates under- or over-application of chemical rates – even at headlands and corners. For more than 30 years, Wilger has been engineering high quality sprayer components. Wilger Combo-Rate nozzle bodies are available on every Case IH Patriot sprayer. When application windows are narrow and every hour in the field counts, operator comfort isn’t a luxury – it’s a necessity. That’s why Patriot sprayers are designed to let operators work longer with less fatigue. Expansive front windshields offer a wide vista of tinted glass and put the operator in control. Ergonomically designed, line-of-sight instrumentation positions critical operating functions right up front, leaving the operator free to focus on the work at hand. The pressurized cabs keep the inside air clean and fresh, while the automatic temperature control and sunshades keep the operator cool and comfortable. The Patriot air-ride seat is adjustable for position, ride firmness and lumbar support to provide the best fit and ride. On the Patriot 4430 (shown above), an exclusive, 40-degree, right-hand swivel seat gives you a 180-degree full field of vision that keeps you from having to strain your neck all day. In addition, the Patriot 4430 instructional seat can be folded when not in use to provide a convenient workstation with cup holders. The optional AFS Pro 700 color display puts total control at your fingertips. From just one display, you can monitor and control both guidance functions and application rate as well as track ground speed, acres covered and other variables. Plus, it integrates seamlessly with AFS software to store, view and manage precision farming data, helping you adjust for in-field variability and improve yield potential. Order your sprayer AFS AccuGuideready, and then complete the installation with the AFS Pro 700 color display, the AFS 372 GPS receiver and the Navigation II controller. These three components can also be transferred from your AFS AccuGuide-equipped tractor or combine onto the sprayer to minimize the overall technology investment. Sprayer control switches (G) are ergonomically placed – attached directly to the operator’s seat. The most commonly used controls are placed on the hydrostatic control lever (H) for one-handed operation. Case IH Patriot sprayers are popular with leading custom applicators, retailers and growers because they help operators consistently make timely and accurate applications. With a deep understanding of production agriculture and agronomic principles, the Case IH design delivers more agronomic advantages that help you get the most out of every tank, every acre, every day. All four Patriot models share key design features that set these sprayers apart, including cab-forward design, advanced boom construction, long field life, easy service and high resale value. Finish the job after nightfall. Standard lighting includes halogen lighting in the front hood, cab and service center/booms along with LED amber turn signals and red tail lights. Optional lighting includes high intensity discharge (HID) lights in the front hood and also on the cab roof, or chassis frame for the Patriot 2230. Cab post-mounted rotating beacons are also available. Optional Wilger Combo-Rate II nozzle body adds flexibility. AFS Pro 700 color display has a big bright screen and is faster, lighter and transferable to other Case IH machines. It allows the operator to easily control application rates and guidance functions. Handles a full range of field loads and travel speeds for a smooth, comfortable ride. 3785 L (1,000 gal.) of Patriot performance. • Improved hood design delivers easy access. Patriot quality for the owner-operator. • Cool, quiet, comfortable Patriot 2230 cab, sized for frame. More time to spray, every day. Time spent on maintenance is time away from the field. Patriot sprayers feature a one-stop service center that lets you perform all tendering functions from a single location. Connections are provided to make it easy to fill tanks from ground level. Large plumbing hoses, direct hose routings and minimal fittings and connections are standard, making tank fill time shorter. Case IH Patriot sprayers are designed to get maintenance out of the way quickly and efficiently… and get you back in the field ASAP. In-field service is a snap. An open architecture design allows easy access to components under the sprayer frame. And ladders, walkways and platforms make it easy to access service points higher up. The easy-access stainless-steel eductor is designed for simple, efficient operation. The chemical eductor lowers to waist level, then stores conveniently out of the way. Lightweight, easy-open hoods on the Patriot sprayer models give you unrestricted access to service items. This access point allows for quick checks or service and gets you back in the field sooner – enhancing the machine’s productivity. To keep things moving, fuel tanks are sized to allow for a full day of spraying. All Patriot sprayers have a full-length walkway that provides easy access to all routine maintenance and inspection points on one side of the sprayer—including the fuel and DEF tanks, cab, product tank and engine compartment.